The comet ISON as seen by the satellite COR2-A , capturing its approach towards the Sun . The comet makes a sharp turn around the hot brutal Sun , and moves away again in space … but not without damage ! 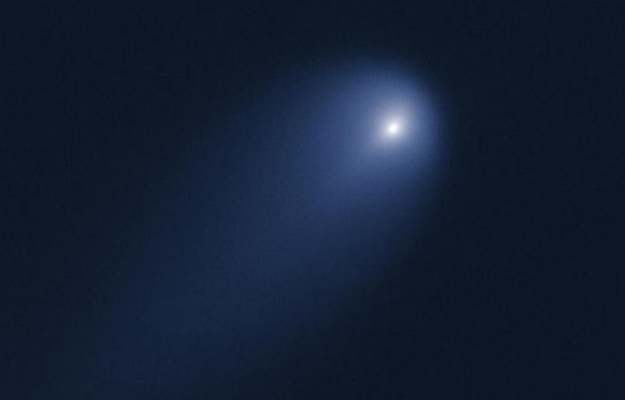 It does not look good and it will probably not be possible to see this comet ISON with the naked eye . Astronomers worldwide are becoming very excited about an approaching sun-grazing comet by the name of ISON . With a bit of luck , this comet could become a very bright comet , visible by the naked eye , visible during day time . Some even speculate it will have a brightness of a full moon ! Yeah !! The NASA video ( in the link below ) is explaining what a sun-grazing comet is .